The Super Soaker SS 10 is the first sub-pistol-sized air pressure weaponry released by Larami Ltd.. Though likely good for back-up, a fully-functional working model is unavailable for review. While images and some basic statistics could be measured, range and output values were not since the blaster tested no longer appears to be operating properly. Probably very fun during its reign, the Super Soaker SS 10 is now primarily a collector's piece. Small size means small payload and output. 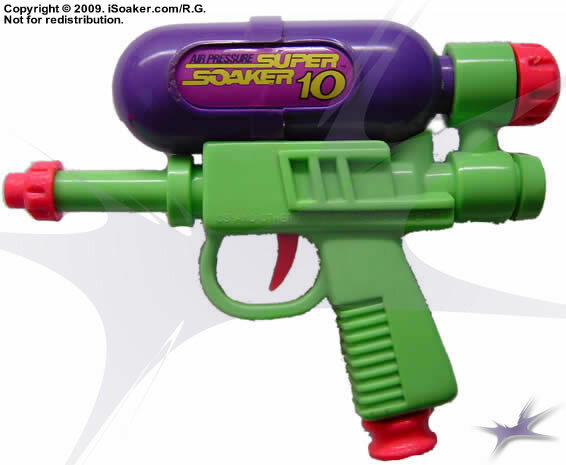 The Super Soaker 10 was the smallest Super Soaker made in the twentieth century. 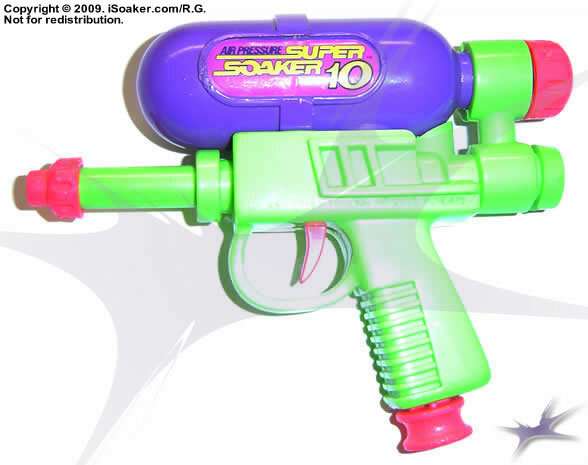 It carried very little water and its output rates rank at the bottom of Super Soaker History. It came in a variety of colo(u)rways with minor physical variations in each, but all performed virtually equal. This gun was obviously not meant to be a gun to fight with, being hardly larger than squirt pistols. The SS 10 has a bad habit of leaking around the tank connection area. The pump is on the bottom, like other small originals, and uses the pressurized reservoir system. Though output is reasonable for a gun of this stature, it still cannot stand its own, even in small skirmishes. Because of its pitiful output, range and capacity, the SS 10 cannot be recommended, even for a backup gun. The user might be better off with a squirt pistol (one would last longer, anyway).